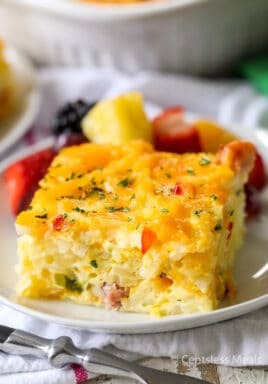 Hash Brown Breakfast Casserole is the perfect breakfast or brunch recipe! 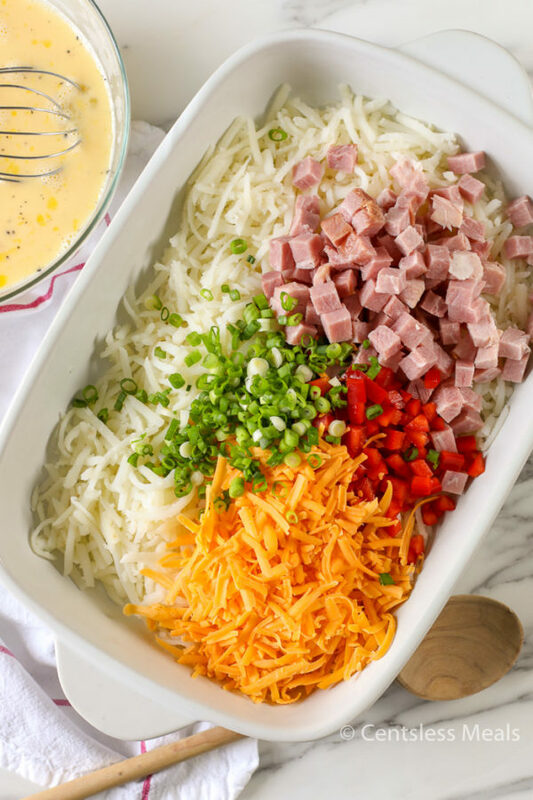 This easy casserole combines tender shredded hash browns, smoky ham and loads of cheddar cheese for a delicious easy meal! 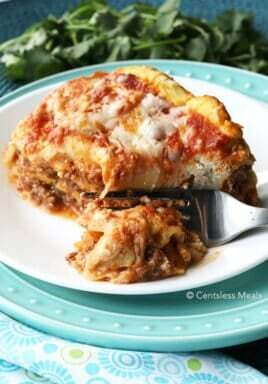 It can be made ahead of time and it is a great way to feed a crowd! Hash Brown Casserole is a favorite breakfast for everyone! Hearty and delicious, this makes a great Easter brunch all in one pan. 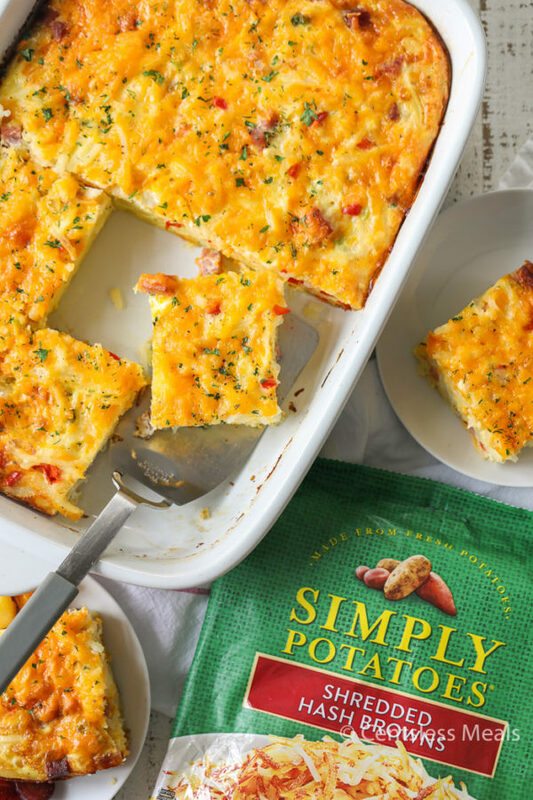 I am so excited to have partnered with Simply Potatoes as a food advocate to bring you this easy recipe! This hash brown casserole recipe is so incredibly easy to make! 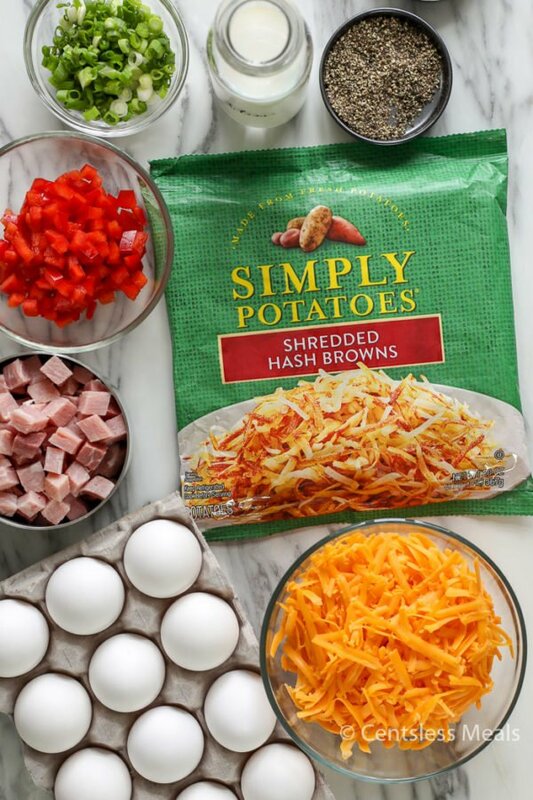 Starting with Simply Potatoes Shredded Hash Browns means this recipe can be in the oven in about 10 minutes! No peeling potatoes, no shredding … and best of all the Simply Potatoes are made with fresh potatoes (never frozen) keeping this recipe tasting just like homemade! Grease a 9×13 pan or casserole dish. Combine Simply Potatoes Shredded Hash Browns with ham, bell peppers, onions and a bit of cheese. Mix eggs, milk, and seasonings and pour over the hash brown mixture. Top with cheese and bake. HAM: This is the perfect meal to use up your leftover Easter ham but any cooked breakfast meat is great in this meal! Try swapping out the ham for cooked and crumbled sausage or bacon! CHEESE: I love the combination of ham and cheddar but of course any kind of cheese is delicious in this recipe! Add a little bit of Italian seasoning to your eggs and try some mozzarella and parmesan! VEGGIES: Peppers and onions add great flavor to this easy hashbrown casserole. Any color of bell pepper will work perfectly. Add in your favorite veggies, leftover roasted asparagus, fried mushrooms or whatever else you may have on hand! Hashbrown Casserole with Eggs is a satisfying recipe, perfect to feed a crowd! This recipe can be prepared up to 24 hours in advance and baked in the morning (making it perfect for a holiday breakfast). If you are preparing this meal ahead of time, remove it from the fridge while the oven preheats. You may need to add 10 minutes to the cook time if your casserole is chilly from the fridge. Serve it alongside a fresh fruit salad or fruit dip for a great Easter brunch! 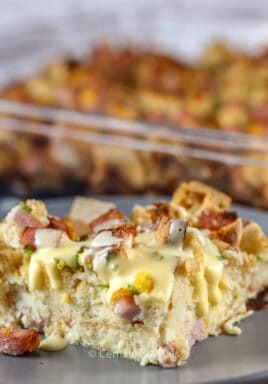 Just like Mini Quiche, leftover breakfast casserole will last about 4-5 days in the fridge. It can be reheated in the microwave for a quick and easy breakfast or lunch any day of the week! If you’d like to store it longer, you can freeze breakfast casserole. We place it in individual servings in freezer bags making it easy to defrost and reheat. 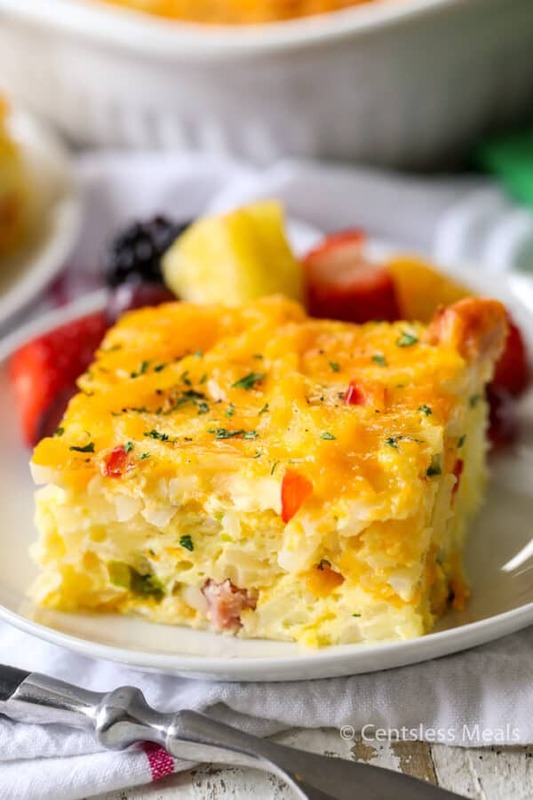 Hash Brown Breakfast Casserole is a great holiday breakfast! Eggs are mixed with shredded hash browns, ham (or bacon) and loads of cheddar cheese! Place hash browns, ham, bell pepper and green onions and half of the cheese in a greased 9x13 pan. Stir to combine. In a bowl, combine eggs, cream, salt & pepper. Pour over hash brown mixture. Top with remaining cheese and bake 55-60 minutes or until cooked through. 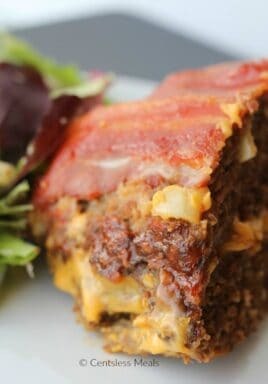 This recipe has been created in partnership with Simply Potatoes! As a food advocate, I receive products and incentives in exchange for participating in Simply Potatoes brand related activities and spreading the word about Simply Potatoes Products.